My husband is a math teacher at a local high school, so he often looks for meaning within numbers. A couple of numbers that happen to have quite a bit of meaning to us are the numbers 800 and 100. 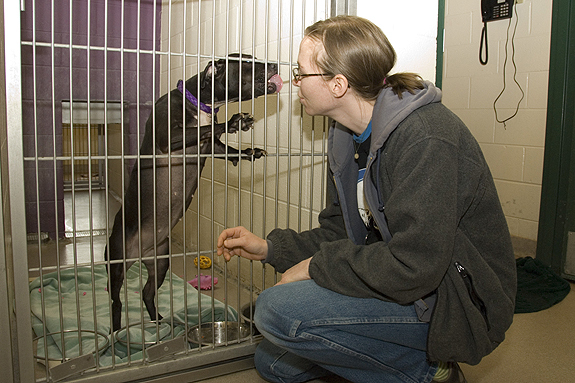 Eight hundred is the combined number of hours my husband and I have volunteered at our local shelter, the Dane County Humane Society in Madison, Wis., over the past four years. One hundred happens to stand for the minimum number of pit bulls with whom we have had the pleasure of spending time. Without our local shelter and the opportunities it has provided us, we might have never had the chance to fall in love with these wonderful stubby dogs. 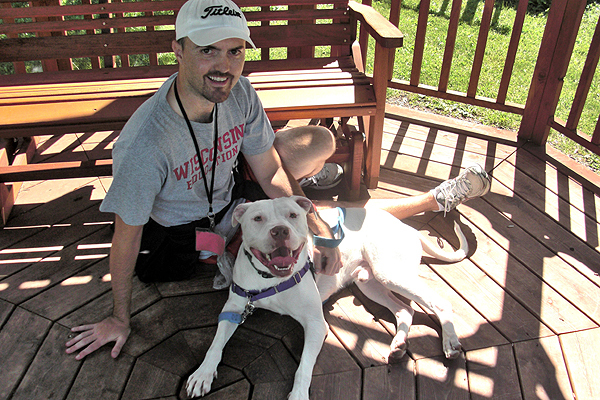 In the late summer of 2008, my husband, who was definitely not a dog person at the time, joined me as a volunteer at our shelter. Initially, we saw it merely as a way to spend some quality time together. However, soon after meeting a pit bull named Diamond, it became something much more profound. Diamond was a beautiful, all-black stray pit bull who was as sweet as could be. As we formed a connection with this dog, we soon realized that she needed much more than just food, water and shelter. Sadly, like many dogs that spend a long time in a shelter environment, Diamond started deteriorating from kennel stress. She simply needed more than what our shelter could provide at the time. It was a Saturday in October when we noticed she was no longer displayed on the shelter’s website. Fearing the worst, we headed there to search for her. After failing to find her, we were informed by a member of the adoption staff that Diamond had been euthanized that morning. This was the first time that we had first-hand experience with the harsh reality of shelter life. From that point on, our focus shifted to providing support to all the dogs that needed extra attention and love. In particular, we found ourselves drawn to pit bull type dogs. Both of our attitudes had previously been shaped by the rumors and misinformation often disseminated by word of mouth and the media. We soon developed a new and better understanding of their plight and were shocked by how much common “knowledge” about these dogs was so blatantly wrong. Because the loss of Diamond gave us a greater appreciation for our role as volunteers, we became more involved at our shelter in a number of ways. First, we went through the required training that allowed us to work with more challenging dogs. We also began to attend quarterly volunteer meetings where we learned about the rigorous daily operations and efforts of the shelter. These meetings also kept us up to date on our shelter’s involvement in humane legislation and cruelty and neglect cases, as well as its frequent fundraising efforts. We also became aware of our shelter’s extensive programming, particularly their highly successful pit bull education and training class. We soon recognized the high quality of our shelter and the tough decisions and limited resources that the shelter staff skillfully dealt with on a regular basis. 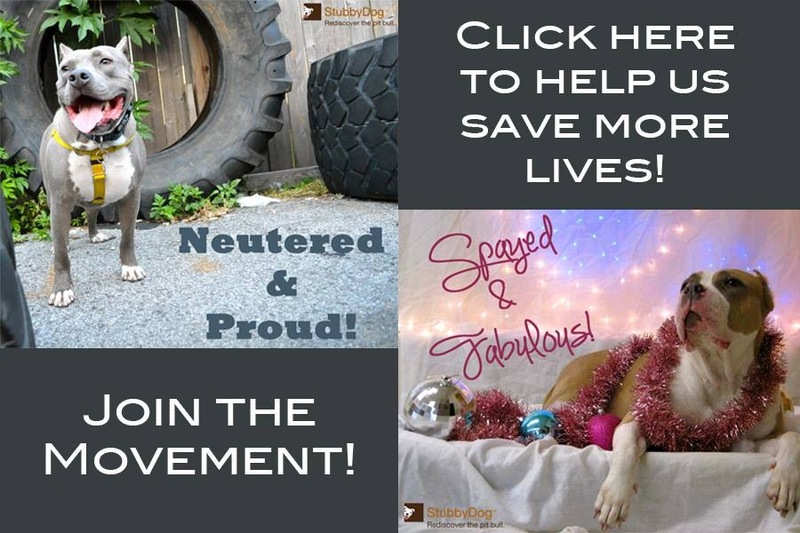 As a result, we have become enormously thankful to be involved with a well-organized, community-supported shelter that does so many positive things for animals (and humans), often without the recognition it deserves. 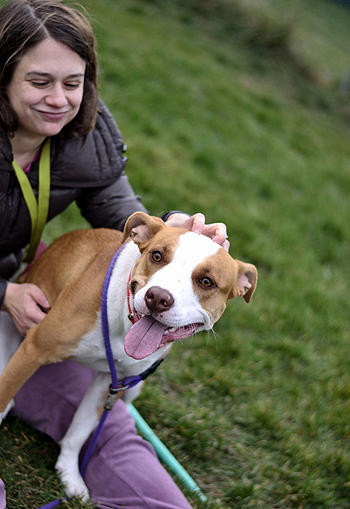 Overall, when we think about what our shelter means to us, there are a few things that come to mind. We see it as a wonderful opportunity to make a difference not only in an animal’s life, but also in our own lives. So often we get bogged down in our own daily concerns that we sometimes lose perspective. Yet when we arrive at the shelter each week, we are re-invigorated by the beautiful four-legged creatures that show us nothing but unconditional love. Our shelter has given us the opportunity to know and love so many of these dogs not only by accepting and adopting them out, but by advocating on their behalf. For this, we are incredibly grateful.